Offering tangible external strengths, great intrinsic values, maximum benefit and low costs, the new Mercedes-Benz Vito is the versatile and real professional among mid-size vans with a permissible gross vehicle weight between 2.8 and 3.2 tonnes. From skilled crafts and trades to retail, service providers, shuttle services and taxis – the new Vito is truly one vehicle for all. With up to 1,369 kg of cargo capacity, it has the highest payload in its class.Meanwhile the Vito Crew featuring a crewcab combines the advantages of a panel van with those of a crewbus. 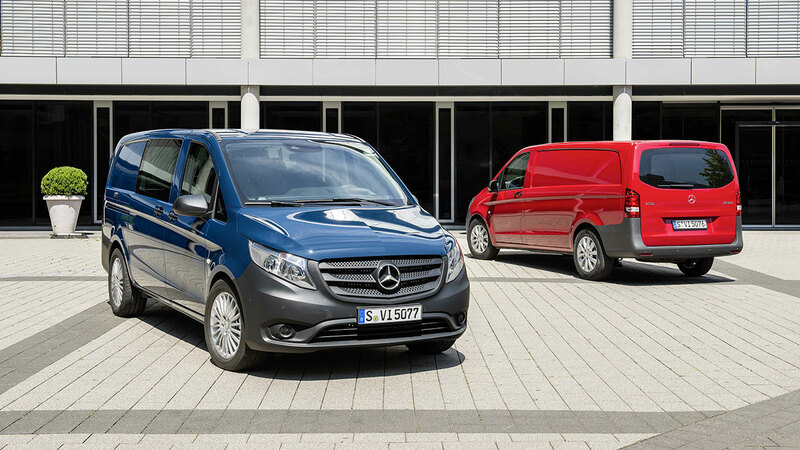 The new Vito Tourer sees Mercedes-Benz opening an entirely new chapter in passenger transport. There are two versions available: the versatile Vito Tourer PRO and the premium Vito Tourer SELECT. By virtue of this complete model family, the Tourer can be tailored to accommodate all types of passenger transport. The new Vito creates an assertive and unmistakable impression. For the new Vito, however, design is not an end in itself. With a Cd value of 0.32 wind resistance is very low. This reduces fuel consumption and improves performance. Even at first glance the new Vito's bodywork exudes high quality, apparent from aspects such as narrow, even joints. Now completely redesigned, the new Vito's cockpit is exemplary in terms of its functionality and ergonomics. Symmetrical in its fundamental form, the structure is clear and uncluttered for maximum operational safety. The cockpit has an exceptionally high-quality look for this vehicle class. During development the stowage concept received plenty of attention. After all, for many drivers the new Vito is their office and a living space too. "One for all" is something that applies to the new Vito's drive system in particular. It is the first vehicle in its class to be available with a choice of rear-wheel and now front-wheel drive too. The correlation is clear: the new front-wheel drive system in the range is very light. When unladen or carrying only a light load, front-wheel drive offers better traction. Proven rear-wheel drive is the right solution for all applications involving heavy weights, high towing capacities and exceptional driving dynamics. 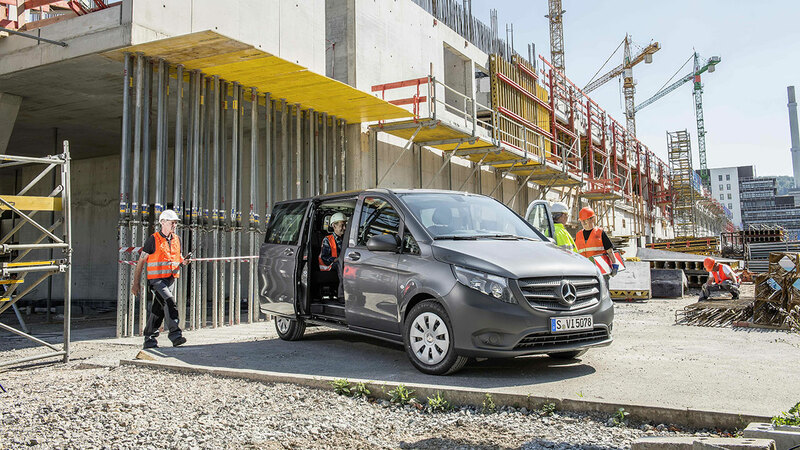 The new Vito with front-wheel drive is made for the following profile: predominantly solo operation with maximum payload at low to medium gross vehicle weights. Keeping costs as low as possible is also a priority. It has a transverse-mounted, compact four-cylinder engine with a displacement of 1.6 litres and which is available in two power ratings: the Vito 109 CDI with 88 hp and the Vito 111 CDI with 114 hp. In cases where demands on performance are high, use will be intensive, gross vehicle weights are high or trailer towing will be demanding, the right choice is the new Vito with rear-wheel drive and four-cylinder engine with a 2.15-litre displacement. It is available at three power output levels Vito 114 CDI, 136 hp; Vito 116 CDI, 163 hp, and Vito 119 BlueTEC, 190 hp. As the first Euro 6 engine in this class, the Vito 119 BlueTEC occupies a special place. Six-speed manual transmissions handle power transmission as standard. The 7G-TRONIC PLUS automatic transmission with torque converter is optional for the Vito 114 CDI and Vito 116 CDI and standard equipment on the Vito 119 BlueTEC. For vans it is the world's only automatic transmission with torque converter and seven gears. From the transmission and low-friction rear axle to the electromechanical steering and auxiliary units – the engineers designed the new Vito for maximum fuel efficiency. On average, consumption of diesel in the NEDC is some 20% less than for the preceding version. The Vito BlueEfficiency is exceptionally economical when it comes to fuel use. This package is available for the new Vito with rear-wheel drive and is standard on all Vito Tourers with automatic transmission, car registration and in conjunction with the most powerful engine. The certified figure of 49.6 mpg for the Vito 116 CDI BlueEfficiency and truck registration is unmatched in this vehicle category. Whatever the engine variant, every new Vito benefits from long service intervals of up to 25,000 miles or two years. The suspension's accepted high quality has been enhanced even further. The starting point is the steering system with electromechanical power assistance and changes to the kinematics. It extends to the semi-trailing arm rear axle with coil springs and new spring and damper tuning. The Vito panel van and Crew are designed for high loads. A comfort suspension is provided as an option for the Crew and as standard on all Vito Tourer models. Features include less taut springs and more sensitive shock absorber control. The new Mercedes-Benz Vito also sets new safety standards. This naturally extends to precision steering and powerful disc brakes all-round (with 16" or 17" braking system depending on the model), as well as Adaptive ESP® as standard. 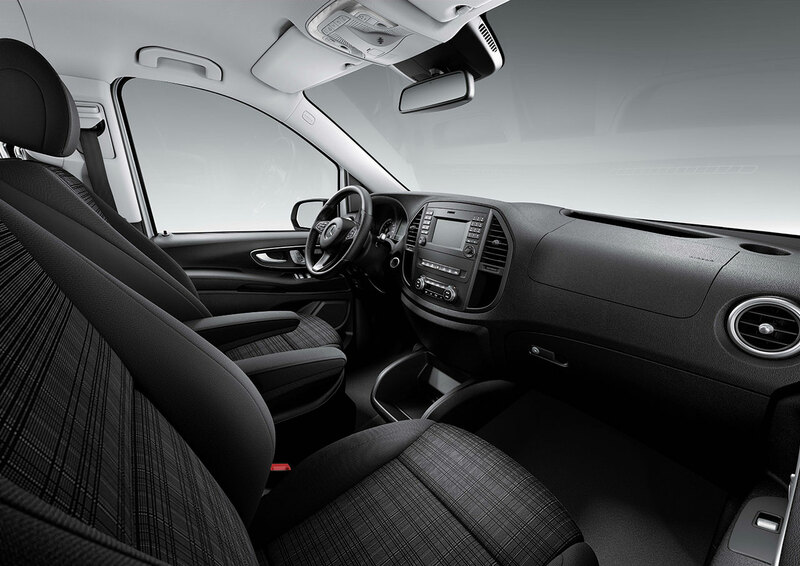 The Vito panel van is the only van to provide airbags and a seat belt reminder for both the driver and passenger as standard. Vito Tourer PRO and Vito Tourer SELECT models also come with windowbags and thorax/pelvis sidebags in the front. For the first time, it is possible to get windowbags in the rear for the Tourer. With up to eight airbags in total, the Tourer is the new benchmark by comparison. The new Vito's standard equipment includes Attention Assist. Based on various parameters, it draws conclusions as to the driver's condition. Uniquely in this class Crosswind Assist comes as standard. Crosswind Assist virtually eliminates the effects of gusts acting on the vehicle. Tyre pressure monitoring is another item of standard equipment. The new Vito may be equipped with other assistance systems to suit individual needs. Active Parking Assist is new and unique for vans. The distance warning function is equally unique in this segment. Blind Spot Assist issues a warning if there are other vehicles in the blind spot when changing lanes, Lane Keeping Assist if the vehicle deviates from its lane. All three lengths are 140 millimetres longer than the preceding Vito. This can mainly be attributed to an extended front end to help protect pedestrians. The resulting vehicle lengths are 4,895 mm, 5,140 mm and 5,370 mm. The maximum vehicle height is 1,910 mm depending on the model. Consequently all variants are significantly below the important two-metre mark and therefore fit standard multi-storey/underground car parks and automatic car washes. The permissible gross vehicle weights at the heart of the range are 2.8 t and 3.05 t. They are complemented by an upgraded 3.2 t Vito. Thanks to the new front-wheel drive in conjunction with a compact diesel engine, the Vito panel van's kerb weight for the medium length with standard equipment is just 1,761 kg. As a result, even the Vito with a permissible gross vehicle weight of 3.05 t achieves a very impressive payload of 1,289 kg. However, the payload champion of its class is the rear-wheel drive Vito, which has a permissible gross vehicle weight of 3.2 t and a payload capacity of 1,369 kg.